September 1, 2017 – Two decades ago it would have been difficult to imagine just how many pivotal discoveries would be in the cards for NASA’s Advanced Composition Explorer, or ACE. 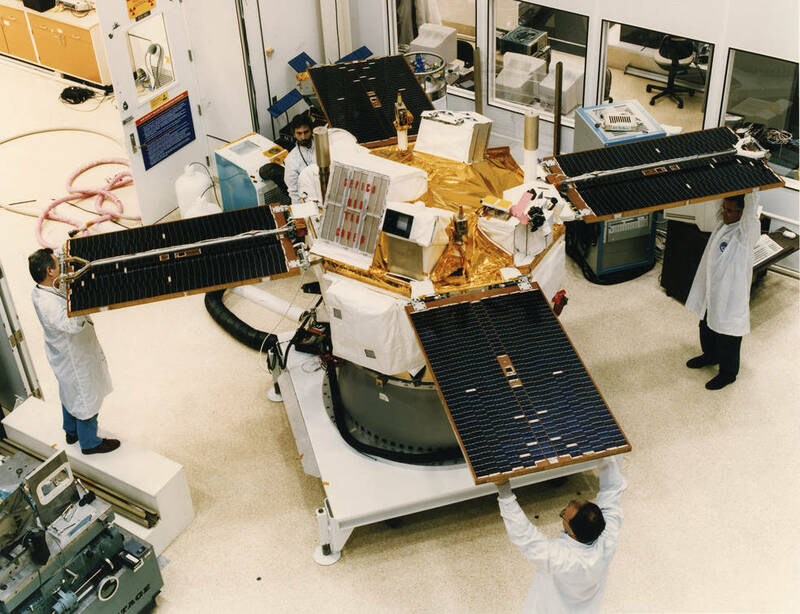 After its launch on August 25, 1997, ACE’s first job was to observe what kinds of matter and energy arrive at Earth from the Sun and from across the galaxy. Countless revelations in our understanding of the Sun and solar wind, the Sun’s interactions with Earth and the solar system quickly followed suit. The original mission timeline for ACE was five years; it’s gone well beyond that time frame, opening doors to mapping out the very nature of the space that surrounds Earth and our solar system, and even helping to protect our home planet from the constant variations in the space environment surrounding Earth. It all started with a launch that placed ACE into a special orbit. Designed and built at the Johns Hopkins University Applied Physics Laboratory (APL) in Laurel, Maryland, ACE orbits a point between Earth and the Sun, called Lagrangian Point 1, or L1. At this spot, Earth’s gravity cancels out the Sun’s pull, providing a stable point where a spacecraft can hover in between, allowing ACE to travel along with Earth as it moves around the Sun. From this vantage point, ACE can observe the charged particles coming from the Sun toward Earth. Not only did this put the spacecraft in the perfect spot to observe the space environment for research, L1 allowed ACE to carve out a leading role as a space weather monitor. Coronal mass ejections — CMEs, for short — are powerful solar eruptions driven by the Sun’s magnetic fields. CMEs send a lot of energy and radiation into space. When those bursts of highly charged particles interact with Earth’s magnetic field, they can be a hazard to satellites, power grids and GPS systems. From its vantage point, ACE monitors eruptions and provides a lead time of 20 to 60 minutes before the charged particles impact Earth. The raw data from ACE are immediately sent from the ground station to the Space Weather Prediction Center in Boulder, Colorado where the data are processed and used by the Space Weather Operations Center and delivered to the CRL Regional Warning Center at Hiraiso, Japan, to the USAF 55th Space Weather Squadron, and placed on the World Wide Web. All of the data is downloaded, processed and dispersed within minutes from the time they leave ACE, so ACE observations can provide an advancing warning of the CME’s speed and magnetic field. Despite its role monitoring space weather, ACE is fundamentally a science research mission: ACE has provided key research to help us better understand not only the Sun but also our galactic neighborhood. Earth is constantly bathed in particles that come from the Sun and all over the galaxy. Each particle carries clues as to where it originated and how it changed during its journey toward Earth. ACE was designed to measure the origin and composition of these particles, largely by scoping out particles called isotopes. Isotopes are forms of an element that have the same chemical properties, i.e. the same number of protons, but different numbers of neutrons—an accumulation of neutrons can make an element heavier. Cosmic rays are high-speed atomic nuclei that arrive at Earth with a variety of energies—the most powerful approach the speed of light. In many ways, the ratio of isotopes of heavy elements in cosmic rays reveal the chemical fingerprints of the cosmos. Because so much of the galaxy is composed of the lighter elements hydrogen and helium, heavy elements form a relatively small portion of the matter in our solar system. So when ACE detects rare heavy elements or rare isotopes of more common elements, that provides an important clue as to where these particles were created. By charting their composition, ACE helped scientists identify how galactic cosmic rays originate. A research team determined that most of the cosmic rays detected near Earth originated relatively recently in nearby clusters of massive stars. Moreover, ACE revealed that the Sun contains a lot more heavy elements than it should based on its current position in the local galactic environment. So, scientists now know that the Sun was either born closer to the center of the galaxy, or there were once exploding stars nearby that enriched the solar nebula with heavy elements. The instruments aboard ACE have, over the course of two decades, revealed many of the complexities behind solar activity. ACE has studied the full range of emissions from the Sun—such as CMEs, for one, but also the constant outward flow of solar material called the solar wind. 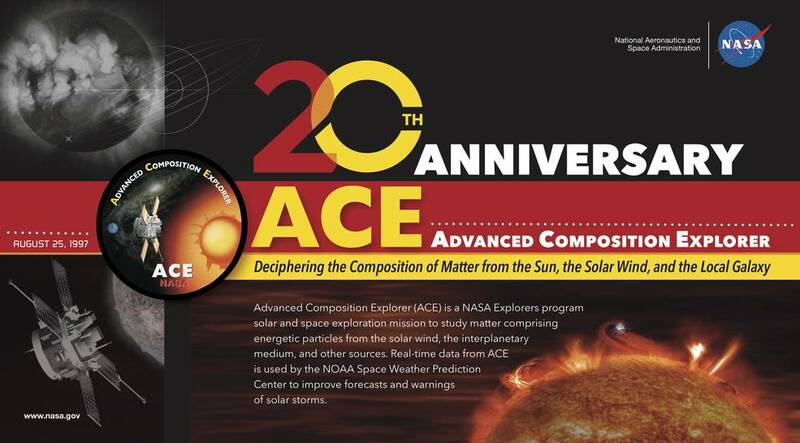 Some of ACE’s most impactful work in this area relates to its measurements of the solar wind. That wind flows throughout the solar system and envelops the planets. The slowest, low-energy particles come from this solar wind, while higher energy particles come from storms like coronal mass ejections and flares. ACE has been very important in helping scientists answer questions about how and why particles can get a big kick of speed as they travel away from the Sun. Though it is certainly an aging spacecraft, most of ACE’s instruments are still in good working condition. ACE could potentially continue delivering incredible science through 2024, when it’s expected to run out of fuel. NASA’s upcoming heliophysics missions could give ACE a newfound relevance. Parker Solar Probe, launching next year, will seek a better understanding of how solar wind gets accelerated in the Sun’s outer atmosphere. Also being built and tested at APL, Parker Solar Probe will travel much closer to the Sun’s surface – seven times closer – than any other spacecraft before it. Combined with ACE’s measurements closer to Earth, scientists will get to see the big picture of the solar wind, from the time it exits the Sun’s outer atmosphere to its arrival at Earth.